A.M. takes bits of music from here and there, and puts them into a computer. Next, he plays some instruments to go along with the bits of music, adds a funky beat or two, and dances around in his room with much enthusiasm. Finally, he gets together with his friends Marty and Drew. Together, they play A.M.'s unique electro-dance-funk to the delight of those who like to dance, chill, or just nod their heads approvingly. A.M.'s music has been featured in film, theatre, on radio and television. He has incited dancing at venues across Toronto, and was recently featured as part of the Wavelength series. A.M.'s music has also been featured on CBC radio and in the Globe & Mail, which made his parents very proud. By day, A.M. teaches 8th grade English and Social Studies in Toronto. Some of his students think it's pretty cool that he makes music. But on the other hand, he's a grown-up, so it can't be all that cool. If you are a fan of Lemon Jelly, Groove Armada, DJ Shadow, Mr. Scruff, or other electronic/hip hop/ambient instrumental artists, chances are you will like A.M. But you don't have to. 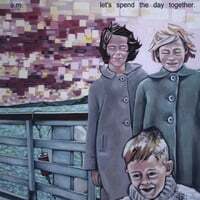 RadioIndy created a CD Announcement Press Release for A.M.
"Let's Spend the Day Together" Reviewed by RadioIndy.com! Billing its sound as “Electro-acoustic party music,” A.M.’s latest CD, “Let’s Spend the Day Together” is all that and more. Not to be confused with American singer-songwriter AM, this Toronto-based performer has assembled an album that is well crafted with electronic soundscapes, “found sounds”, samples, and last but not least, sheer sonic invention, that is as intriguing as it is musically satisfying. Tying the project together are real-life samples provided by people from all over the world, intended to represent a “snapshot of a day in the life of humankind.” It’s a concept that unfolds with the ease and naturalness only an accomplished musician / DJ could pull off. Weaving these samples throughout the album, the result is a combustible mix of instrumentals variously built on both synthesizer and acoustic instrumentation, alternately lush and lyrical, primal and orchestral. Each tune is crafted with a keen eye towards melody and dynamics, and utilizes chord and aural changes that keep the proceedings both fresh and forward moving. While A.M.’s latest CD, “Let’s Spend the Day Together” is, in fact, an album perfect for a party / club setting, there is so much going on here that only multiple listens will render full appreciation, and ultimately reveal the depth of compositions and the superb musicianship of the artist and his collaborators. Recommended if you like Groove Armada, Lemon Jelly.